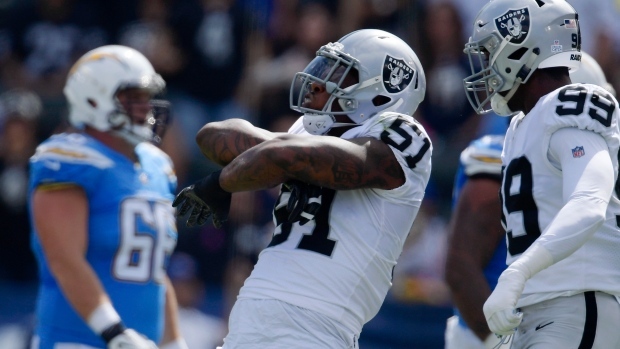 Veteran pass rusher Bruce Irvin, who split last season between the Oakland Raiders and Atlanta Falcons, reached an agreement on a one-year contract with the Carolina Panthers Tuesday, according to a report from ESPN's Adam Schefter. Former Falcons’, Raiders’ and Seahawks’ DE Bruce Irvin reached agreement on a one-year deal with the Carolina Panthers, per source. The 31-year-old Irvin finished with 19 tackles and 6.5 sacks in 16 games last season, split evenly between the Raiders and Falcons. Irvin started his career with the Seattle Seahawks after they drafted him 15th overall in the 2012 Draft, and has 43.5 career sacks in seven seasons.